Those of you who know me most likely know that I am quite the VIM fan. At any time, there is at least one VIM window open on my computer. I just like the speed of editing and the flexibility it offers. I even use VI bindings in my UNIX shells (set -o vi). And yes, I did write my book in VIM. Basically, if I type “:F”, it makes my font larger. I know, not earth shattering, but really useful. This is my complete .vimrc file. 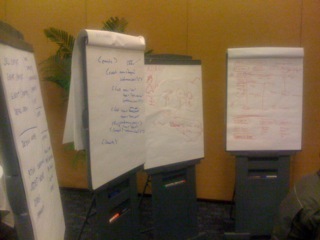 If you have been interested and been following event interchange formats or logging standards, you know of CEF and CEE. Problem is that we lost funding for CEE, which doesn’t mean that CEE is dead! In fact, I updated the field dictionary to accommodate some more use-cases and data sources. The one currently published by CEE is horrible. Don’t use it. Use my new version! Whether you are using CEE or any other logging standard for your message formatting, you will need a naming schema; a set of field names. In CEE we call that a field dictionary. The problem with the currently published field dictionary of CEE is that it’s inconsistent, has duplicate field names, and is missing a bunch of field names that you commonly need. I updated and cleaned up the dictionary (see below or download it here.) Please email me with any feedback / updates / additions! This is by no means complete, but it’s a good next iteration to keep improving on! If you know and use CEF, you can use this new dictionary with it. The problem with CEF is that it has to use ArcSight’s very limited field schema. And you have to overload a bunch of fields. So, try using this schema instead! I was emailing with my friend Jose Nazario the other day and realized that we never really published anything decent on the event taxonomy either. That’s going to be my next task to gather whatever I can find in notes and such to put together an updated version of the taxonomy with my latest thinking; which has emerged quite a bit in the last 12 years that I have been building event taxonomies (starting with the ArcSight categorization schema, Splunk’s Common Information Model, and then designing the CEE taxonomy). Stay tuned for that. Project Lumberjack which has some field names. SyslogNG PatternDB has a bunch of patterns and they also have a Schema. 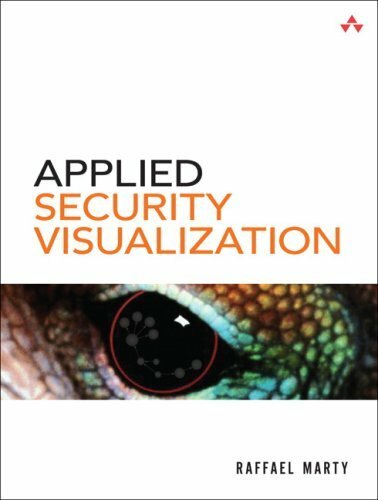 It’s been a while since I wrote “Applied Security Visualization“. Here is an older video that I just came about. A good overview of the book. Enjoy! UCF is the first WAN-aware, store-and-forward, encrypted, compressed IT data transport. It allows customers to gather IT data, increase resilience, reduce network chatter and encrypt from almost any device, anywhere, quickly and easily. UCF leverages a new transport and store protocol that LogLogic intends to open source in the near future. Sounds a whole lot like syslog. (syslog-ng and rsyslog seem to support exactly this!) Okay, let’s just look at this description: WAN aware? What the heck is that supposed to mean? You mean it won’t work well on a LAN? Does that mean it knows the Internets? That’s just a strange description to start with. Oh, and it’s the first property mentioned! The rest of the description sounds like a transport protocol. Interesting. Why not stick with syslog that is well known, has proven to work, and has integration libraries built already. I never understood why vendors implemented their own transport protocols. They are hard (very hard) to implement and even harder for producers and consumers to adopt to. Oh well. When people talk about UCF, they keep bringing up ArcSight’s CEF. Well, I am greatly responsible for that specification. But guess what? It’s not a transport protocol! It’s a syntax definition. It tells a log producer how to format their log file. Not how to transport it. Because, there is always syslog that a lot of machines have installed already and it’s easy to use. (And in newer versions you get encryption, caching, etc.). Now, my last point about standards. Why do vendors keep trying to come up with standards by themselves? It just doesn’t make any sense. How is going to adapt it? At ArcSight, about 4 years ago, we came up with CEF because CEE didn’t move fast enough and we wanted something that our partners could easily use. An analyst wrote that ArcSight is planning to take CEF to the IETF. I hope they are not going to do that. I don’t have any control over that anymore, but that would be stupid. We rather push CEE through IETF. If you have a chance, compare the CEE syntax proposal with CEF. Notice something? Yes. It’s very similar. Again, I might have had something to do with that. Anyways. Vendors should not define logging standards! On a good note: CEE is moving forward and just released the architecture overview for public commentary. Check them out! With the ever-growing amount of data collected in IT environments, we need new methods and tools to deal with them. Event and Log Analysis is becoming one of the main tools for analysts to investigate and comprehend the state of their networks, hosts, applications, and business processes. Recent developments, such as regulatory compliance and an increased focus on insider threat have increased the demand for analytical tools to help in the process. Visualization is offering a new, more effective, and simpler approach to data analysis. 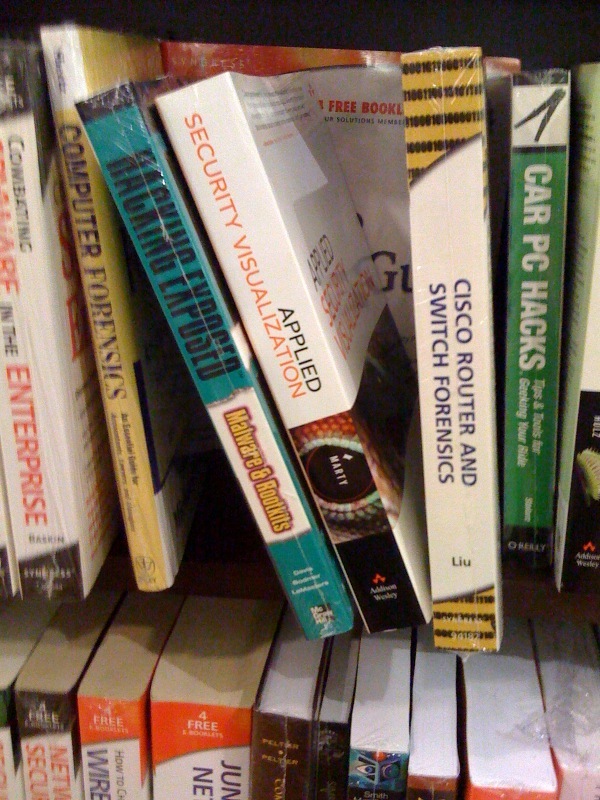 To date, security visualization, has mostly failed to deliver effective tools and methods. This presentation will show what the New York Times has to teach us about effective visualizations. Visualization for the masses and not visualization for the experts. Insider Threat, Governance, Risk, and Compliance (GRC), and Perimeter Threat all require effective visualization methods and they are right in front of us – in the newspaper. 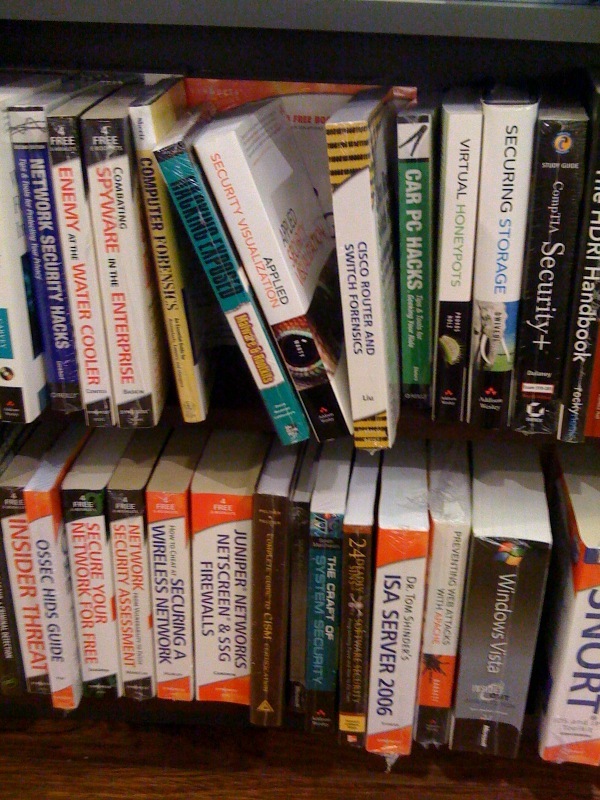 A friend just sent me couple of pictures he took in a bookstore in Singapore. 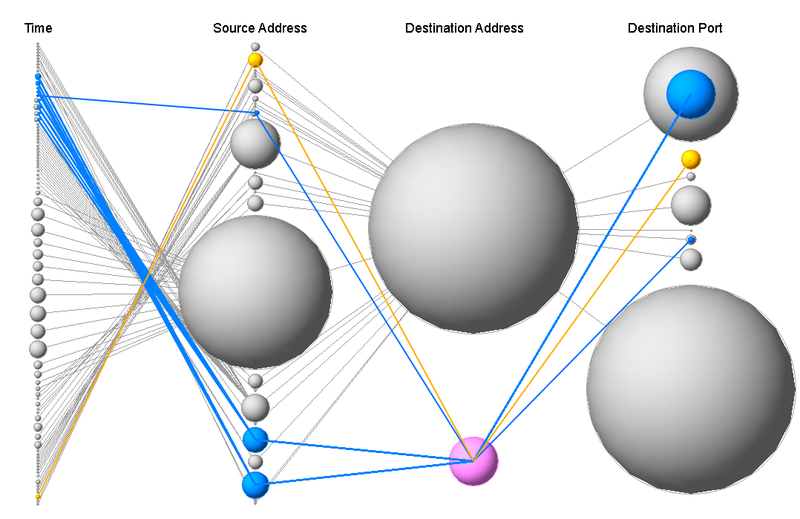 Security Visualization and Log Analysis Workshop – Sign up now! “Log Analysis and Security Visualization” is a two-day training class held on March 9th and 10th 2009 in Boston during the SOURCE Boston conference that addresses the data management and analysis challenges of today’s IT environments. Students will leave this class with the knowledge to visualize and manage their own IT data. They will learn the basics of log analysis, learn about common data sources, get an overview of visualization techniques, and learn how to generate visual representations of IT data for a number of different use-cases from DoS and worm detection to compliance reporting. The training is filled with hands-on exercises utilizing DAVIX, the open-source data analysis and visualization platform. KisGearth – Porting your Wardrives to GoogleEarth . . .